Bubba Wallace will race in this Saturday’s Gander Outdoors NASCAR Truck Series race at Martinsville with AM Racing. after being called up by AM Racing to give car development feedback. “In an effort to advance the performance component of our program, we will be putting a different Chevrolet driver in the seat of the No. 22 Chevrolet Silverado for Martinsville this weekend. We are pleased to announce Darrell Wallace Jr. as the driver,” AM Racing said in a prepared statement. “He has been selected with very specific objectives regarding program feedback and development. His record at the track speaks for itself,” the team added. 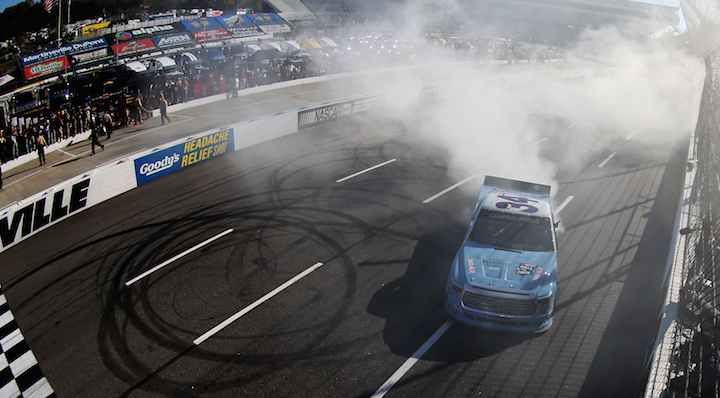 Wallace has taken two Truck Series wins at Martinsville, one in 2013 and one 2014, both of which came during his tenure at Kyle Busch Motorsports. He also took a top five finish at the track in K&N Pro Series East in 2010. Speaking of Kyle Busch, the Cup Series driver will again be racing in this Saturday’s Truck Series race, looking to grow his tally of wins to 201. To date, Busch was taken 53 Monster Energy NASCAR Cup Series wins, 94 in Xfinity Series wins and 53 Gander Outdoors Truck Series wins. In a tweet, Wallace joked that Busch may give fans a reason a turn Saturday’s race off due to his high probability of winning, but that he hopes to give his former boss a challenge at one of his best tracks. The Martinsville 250 is set to go live live on Saturday, March 23rd at 2 p.m. ET. Click here for a full schedule for this weekend’s NASCAR festivities.